This is BottleYourBrand’s american ipa gifts bottle neck labels page, where you’ll find many design templates of american ipa gifts bottle neck labels ready to be customized with your unique text, photos and artwork. It's easy to create your own personalized bottle neck beverage labels online. These labels are perfect for DIY homebrewers, wine making supplies, bottle neck hanger kits & unique custom bottle neck gifts. Orders ship fast and all of our products are 100% guaranteed! Custom bottleneck bottle labels are full color, waterproof & self-adhesive. There is no minimum order size and you can order them in sheets. 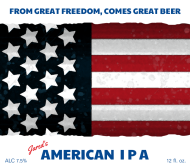 To see some of the other products available on bottleyourbrand.com, please take a look at our main american ipa gifts section.